JSE-listed cellphone group MTN plans to spend almost US$200m (R1,5bn) in total on high-capacity undersea cables serving markets in Africa and the Middle East. That’s the word from outgoing MTN president and CEO Phuthuma Nhleko, who says the group has already spent tens of millions of dollars of the committed amount, with more to come in the next 18 months. 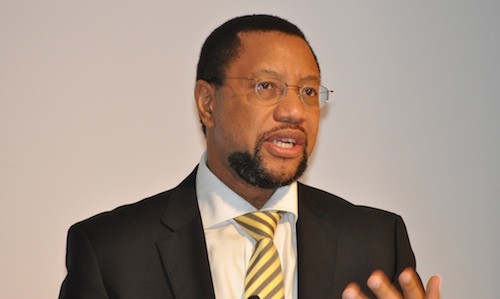 Nhleko (pictured), speaking at the presentation of the group’s 2009 financial results, says MTN is investing in a range of cables to allow it cheaper access to bandwidth in the markets it operates in across the region. Systems it has invested in include Sat-3/Safe, the Europe-India Gateway, the East African Submarine System, Kenya’s East African Marine System (Teams) and the West African Cable System. Sat-3/Safe and Teams are already operational; the rest will come online between now and the second half of 2011, according to MTN. The commitments to undersea fibre are in addition to huge investments in new network infrastructure made by MTN in 2009. During the year, the group spent R31,2bn on infrastructure. About a third of this money, R10,2bn, was spent in Nigeria, MTN’s largest and most profitable subsidiary. It spent R9,6bn in Nigeria in 2008. The group ploughed R6bn into the SA operation (from R4,9bn in 2008) and R3,3bn into Iran (R2,7bn previously). Ghana received R2,6bn in capital spending. The SA and Nigerian markets have benefited from an aggressive roll-out of 3G base stations. Nhleko says he expects group capital expenditure to fall sharply in 2010, to about R23,6bn, with nearly R4bn less being spent in Nigeria. He says 2009 probably represented the peak in group infrastructure investment.